Since PA Day falls on a Saturday this year, we are celebrating one day early! For today's Member Spotlight, we are featuring Derek Deutsch, MPH, MS, PA(ASCP)CM, a 2015 Rosalind Franklin University of Medicine and Science graduate and member of the AAPA Membership Committee. AAPA: How do you feel you make a difference in your position as a PA? Derek Deutsch (DD): Every Pathologists’ Assistant is a brand ambassador for the profession. The broad scope of clinical practices we perform allows us the ability to serve and impact a wide range of services as well as interact with a widespread and diverse audience. Each of us is able to be an educator, advocate, medical professional, and so much more. I have been fortunate to be in several positions that allow me to promulgate and enhance the understanding of a Pathologists’ Assistant. I have worked with hospital administration to create policy, help with CAP inspections, and enhance quality assessment/quality control measures. Day to day operations include directing workflow and communication between laboratory sections and acting as a liaison between interdepartmental services, especially with intraoperative consultations. Furthermore, working at an academic institution, I am able to work with residents, participate in research and conference presentations, and educate/instruct rotating medical students, post-sophomore fellows, individuals interested in shadowing/experience opportunities, and even give presentations to advanced science high school summer students. With every interaction being an opportunity, it is important to present and promote our best selves – highly trained mid-level providers, and integral parts of an efficient and effective medical laboratory team – to further our value, and increase the understanding of how we enhance the quality and delivery of care so that we not only delineate current expectations and standards, but also push existing boundaries and generate opportunities in the future. AAPA: What does being a member of the AAPA mean to you at this stage in your career? DD: I’m proud to be a member of the AAPA. As a member, I feel connected to my colleagues and involved in my profession. With ongoing participation, I know that I will stay current with trends, guidelines, and policy through conferences and AAPA publications, as well as take comfort knowing I have the support and resources available of a large and helpful community/organization. AAPA: How has the AAPA made a difference in your career? DD: The AAPA provided valuable resources to me at the beginning of my career, primarily through the job hotline, the salary survey, and free CE opportunities. As my career has progressed, the utility and benefits of membership have transitioned to networking and highlighting current topics and events concerning the profession. Most recently, it has provided me an opportunity to contribute as a member of the Membership Committee and participate in the future direction and aspirations of our association. AAPA: What is your favorite specimen and why? DD: I love the specimens that no one wants to touch; whether it is an adhesed, complex, stinky mess of a resection or the 20th post-holiday weekend placenta. If you can keep that kind of attitude, not only will you have a great library of stories, but you’ll always have job security and thankful coworkers. It's time to share your story! 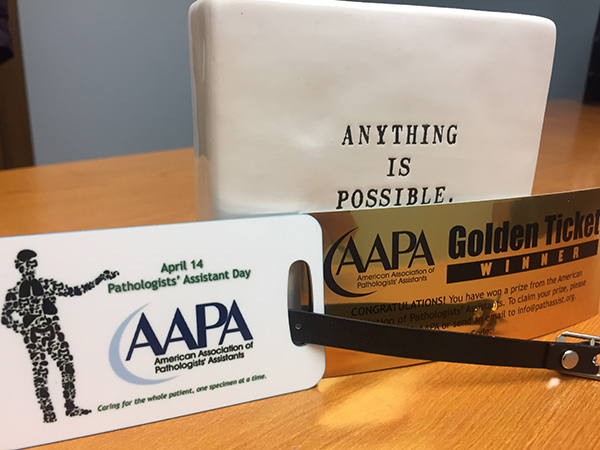 Add a post to our PA Day Blog, share photos and updates to the Member Community feed directly through our new app, upload photos to the PA Day Photo Gallery, tag us on social media (Facebook, Twitter, and Instagram), and use the hashtags #PathassistDay and #TheAAPADifference!